Most Israelis, from a wide political spectrum, including right wing parties, are pragmatic and willing to compromise on territory in exchange for peace (or at least quiet). In short I may believe that Nablus and Hevron are ours, but for many reasons I do not want Israeli soldiers there. Sadly though, the Arabs are not willing or able to compromise. The Arab response to Israeli offers of compromise is inevitably violence. That violence has not achieved anything for the Palestinians and has probably only worsened their situation. In 1936 Arabs rejected the offer of compromise of the Peel Commission. Never again would such a generous offer be made to the Arabs, but they rejected it and continued the violence of the Arab revolt in Palestine. It was not the first time Arab Palestinians had acted violently against Jewish Palestinians, the first major episode of violence was in 1929. In 1947, instead of accepting the UN Partition Plan, the Arabs of Palestine, helped by neighbouring Arab countries, leashed violence against the Jews of Palestine, violence that developed into the 1948 Arab Israeli War. There is no doubt that this was the fatal mistake of the Palestinians and they are paying for this mistake to this day. Between 1949 and 1967 Egypt illegally occupied the Gaza Strip, and Jordan likewise illegally occupied the West Bank. According to United Nations' resolutions these territories should have become a Palestinian State. Egypt or Jordan made no effort whatsoever to handover these territories to the Palestinians or to set up a Palestinian State. The West Bank and Gaza were used as launching pads for terrorist attacks on Israel. In 1967, after the Six-Day War the UN Security Council passed Resolution 242. the Arab position as reiterated at Khartoum, remained the same: "No peace with Israel, No recognition of Israel, No negotiations with Israel" (the 3 nos of Khartoum). To get back territories captured by Israel, Egypt and Syria did not negotiate with Israel as ordered by the UN, but started the Yom Kippur War. In 2000 the Palestinians rejected the generous offers made by Israel at the critical Camp David Summit and started the horrific Second Intifada. In August and September 2005 Israel unilaterally withdrew from all parts of the Gaza Strip. Instead of utilizing this opportunity to improve life for the 1.4 million Palestinians in the area or even to unilaterally create a Palestinian State there, the Palestinians have concentrated upon rocket and mortar attacks on southern Israel. The true aim of the Palestinian leadership and various (mostly terrorist) groups is not the end to the so called "occupation" but the removal of Jews from the whole region. The occupation is a side issue used by Palestinians to justify their rejection of a Jewish presence in the region and by some Arab states to ostracise Israel. I can easily prove this. (1) Violence against Jews in Israel/Palestine started long before the "occupation" of the West Bank and Gaza, it started before Israel was founded. (2) Most of the "occupation" is non-existent or ended years ago. In fact about 98% of the territory once said to be occupied by Israel is no longer occupied. * Israel withdrew from the Sinai Peninsula under the peace agreement with Egypt. * Israel withdrew from most of the West Bank under the Oslo Accords (although some places there are once again under occupation because of anti-Israel terrorist activity originating from there and pending further peace treaties). * Israel withdrew unilaterally from all Lebanese territory. But still the Hizbullah's stated aim is the destruction of Israel. * Israel withdrew unilaterally from the Gaza Strip. And today it is controlled by Hamas who call for the destruction of Israel and is the source of violence against surrounding Jewish towns. * Israel withdrew from other parts of the West Bank under the peace treaty with Jordan. The Arab agenda against Israel is clear and unmitigated: the use of violence to destroy Israel and remove the "alien" Jews from the area. For the Arab nationalist or Muslim fundamentalist, Zionist control of any part of Israel is occupation. Jihad El-Khazen recently summed this up in his column at alarabiya.net/views: "I say that all of Israel is an illegal settlement on Palestinian land. Israel will never be deemed legitimate by any authority in the world", could not be clearer than that! To describe the Jews in Israel as colonialists is to deny our right to be here. But for most Palestinians we are colonialists anywhere and everywhere in Israel. For the Palestinians, all of Israel is theirs, any Jew in Palestine is occupying their land, thus the ultimate aim of the Palestinian people is the removal of Jews from Palestine ie Israel. "The practice of acquiring control over another country, occupying it with settlers, and exploiting it economically". "Colonialism is the extension of a nation's sovereignty over territory beyond its borders by the establishment of either settler colonies or administrative dependencies in which indigenous populations are directly ruled or displaced". Israel is not colonialist. The West Bank is not "another country", it is not "beyond [Israel's] borders". We are not controlling another country. In all of history there never was an Arab country called Palestine there never was a separate Arab entity in Israel. Even the Arab countries, Jordan and Egypt, that occupied the West Bank and Gaza from 1948 to 1967 did not make an Arab country (Palestine) in these territories. (See Occupation of the West Bank and East Jerusalem by Jordan and Occupation of the Gaza Strip by Egypt in wikipedia.) Israel belongs to Israel. It is our country, at least from the Jordan River to the Mediterranean Sea: Jerusalem, Judea, Samaria, Negev, the whole country. Jews have lived in Israel for centuries. There was a sovereign Jewish state here years ago. Jews in the West Bank are living in their own country not colonizing some foreign place. Jews fulfilled an age old dream: the return to the ancestral homeland, Israel. Jews claim a historical and moral right to Israel. Territorially Israel is usually defined as the land between the Jordan River and the Mediterranean Sea. In the 20th century many Arab groups set up their own states in West Asia and North Africa, but because of the Jewish State in Israel, the Arabs of Palestine did not set up their own state. It is true that Jews denied or ignored the rights and even existence of the existing Arab communities in Palestine. In the war of 1947-1949 between the Jews and the Arabs of Palestine, many Arabs left Palestine. The circumstances that Arabs left Palestine are controversial. Regardless, the lack of an Arab Palestinian state is the primary source of grievance for the Palestinians. Israel believes that a Arab Palestinian state in Israel and the return of the Arab refugees to Israel would endanger Israel. The Arab lack of willingness to accept a Jewish state in Israel, the occupation of land by Israel that the Palestinian Arabs claim as theirs and the ongoing violence, make a resolution very difficult to achieve. When I see all of the imams and rabbis coming together, this is a message to the Creator that we are here to do Your will, that is to bring peace. 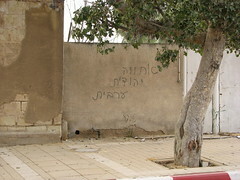 The graffiti says "JEWISH ARAB BROTHERHOOD"
I subscribe to those sentiments.